Link to review of Episodes 1-8. “Love is a snowmobile racing across the tundra and then suddenly it flips over, pinning you underneath. At night, the ice weasels come.” – Matt Groening. 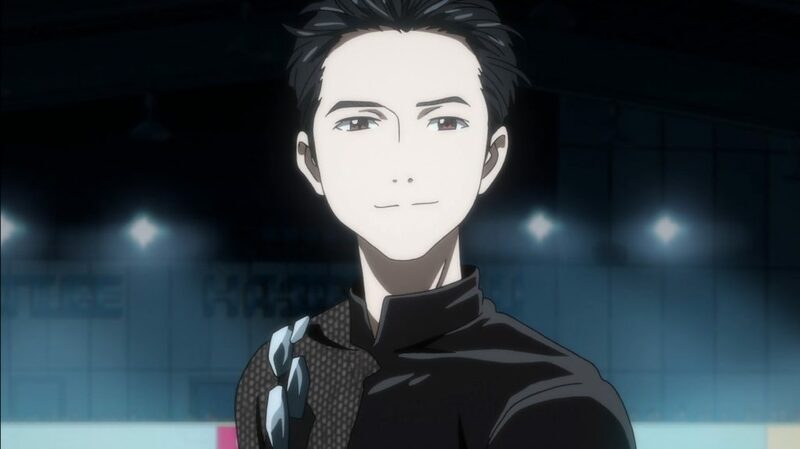 Having finally reached the end of the series, waiting to see what would be the outcome of Yuri Katsuki’s progress through the Grand Prix, and the nature of his relationship with coach Victor Nikiforov, my overall reaction is one of… well, I don’t really know to be honest. I’m not ecstatic, nor am I as disappointed as I thought I was going to be. However, by the time I had finished writing this piece, I think I finally cracked it. 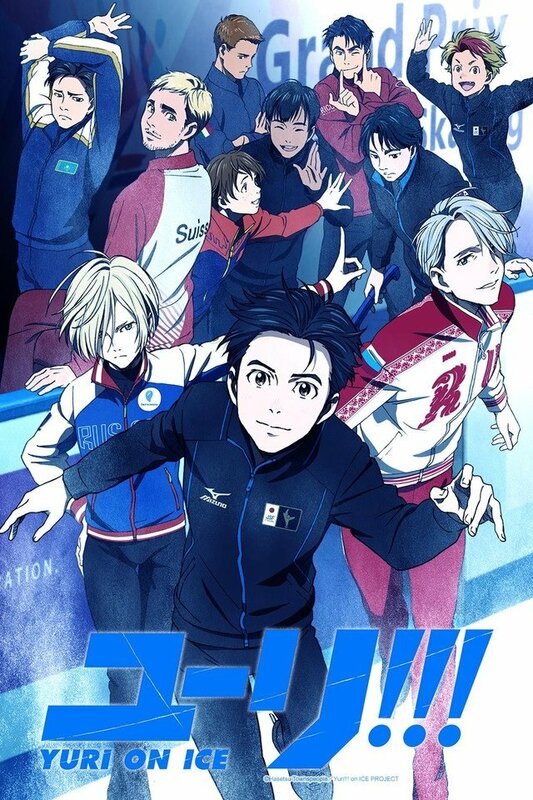 The eighth episode ended with Victor flying from Moscow back to Japan after Yuri K. learns that Victor’s beloved poodle Makkachin has been rushed to the vets when it was found choking. Thus Victor’s old coach, Yakov, who is also Yurio’s current coach, agrees to serve as Yuri K.’s temporary coach while Victor is away. In the end, Yuri K. gets third place in Moscow with Yurio coming second, and first going to the rather overbearing Canadian J.J. Leroy. Yuri K. then returns home, with Makkachin perfectly well. The scores for both Yuris are enough to take them to the grand final in Barcelona, with the tenth episode being told from Victor’s viewpoint rather than Yuri K’s. This episode, mainly serving as a run-up to the main competition, has what I think is the best scene in the series. While much has been made of the kiss scene in episode seven – a scene which Crunchyroll has nominated for a prize in their first ever “Anime Awards”, for me the single best scene in the whole of Yuri!!! On Ice occurs when Yuri K. decides to get a good luck charm for the final. This charm is a pair of gold rings for both himself and Victor, which they both wear. As a result, it is seen as deeply symbolic in terms of their relationship. When they meet the other skaters people think they are married, but Victor just says they are engaged. This remark clearly upsets Victor, and the final episode is partly about whether or not Yuri K. and Victor will continue working together. As to what happens in the final round, well, I don’t want to give away the critical details, but I think it is safe to mention the things that occur after the contest is over. One is is a gala exhibition in which Yuri K. and Victor are skating together – something fans of the show are saying is a big deal because two men skating together in a competition is something that never happens. The other thing is a message to the viewer: “See you NEXT LEVEL”, indicating the possibility of a second series. As I said, I was expecting to react to the ending in one of two ways: anger or joy. In fact, anger was my reaction when I logged onto Crunchyroll to watch the last episode. For starters, I needed to update my Adobe Flash Player, so I thought, “Oh God, I’m now going to be behind everyone else watching it.” What I didn’t notice while I was updating the software was that everyone else was angry because Crunchyroll hadn’t put the episode up at all. They were nearly 20 minutes late putting up the most anticipated finale of the season and people were understandably furious. I admit it is a bit of a ‘first world problem’, but as the main anime streaming website for most people, you expect Crunchyroll not to have these issues. 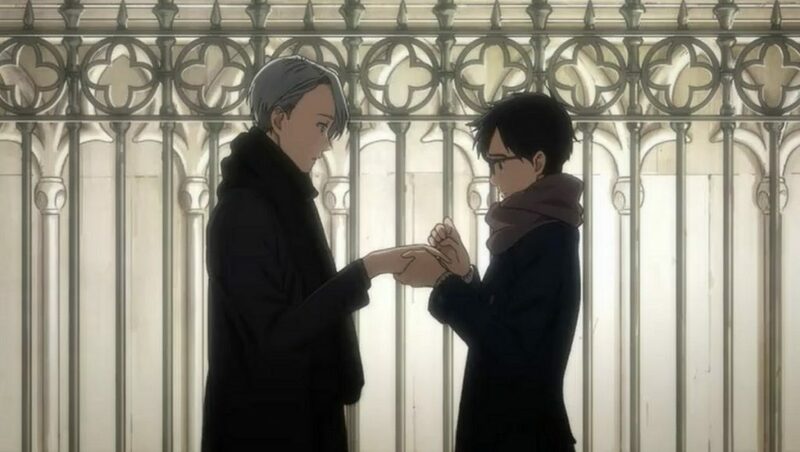 In terms of watching the finale itself, I think I have finally reached my conclusion as to the proof of whether Yuri and Victor are a gay couple. I think there actually is conclusive proof – but again, not the sort of proof I was expecting. It comes at the top of the episode, following on from Yuri K. saying he wants to end it all. 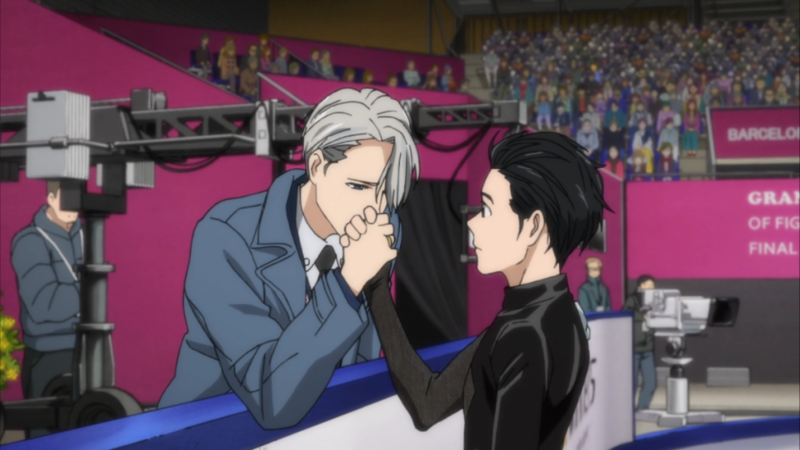 As he explains, I think I see the true indication that Victor loves Yuri – Victor cries. For all this time, I was hoping to see something happy to indicate their love, but in the end, it was something that was sad. The idea that your relationship might end, the possible heartbreak, is for me the final indicator. If the kiss is the initial spark, and the rings the visible sign of love, then the tears are proof that you don’t want it to end. I have been saying all the time that what I wanted was text rather than subtext – but in end, I think the subtext did actually pay off. If there is a second series we might get text then, but for now, I think everything’s OK.
That crying scene overall speaks volumes to me. All the time it has been the kissing and the verbal indications, yet what love really is, when you get down to it, is emotional. As I said in my previous review, I’ve been in a long distance relationship with a genderfluid American for six years. The one thing we have never been able to do is meet in real life. If and when we do, it will be a glorious, passionate moment, but when he no doubt gets on the plane back home and returns to his everyday life, I know I will cry bitter tears. As I write this passage out, I am even on the verge of tears knowing that this moment might never even happen, because we still might never get to physically encounter each other. If there is a second series, I really do hope we get to see the relationship between Yuri and Victor flourish, and I do think that if we see that fully uncensored kiss I would put it up to 10, but I would also really hope that Rui and IncendiaryLemon bicker less.